Former Spokesman editor Curt Kipp and former Wilsonville mayor and longtime politician John Ludlow didn't always see eye-to-eye in the political arena. Yet the two have gotten to know each other better through the Rotary Club of Wilsonville and Ludlow came to believe Kipp to be a talented communicator with a giving heart and an apparent love for Wilsonville. In turn, Ludlow nominated him for a prestigious community award. "You think about what the Rotary does ... he's involved in everything," Ludlow said. "The people integral to our success are the people who work it and Curt works it." After Ludlow's nomination, the Rotary Club of Wilsonville named Kipp a finalist for the First Citizen award, given annually to an exemplary member of the Wilsonville community. John Budiao, Scott Nichols and Donna Atkinson are also finalists for the award and the winner will be chosen during the Stars of Giving: The 2019 Heart of Gold Dinner and Auction Saturday, Feb. 23 at the Wilsonville Holiday Inn. Kipp was also a finalist in 2016. Kipp was first introduced to the Wilsonville community when he took a job as a reporter for the Spokesman in 1998. He eventually was promoted to editor, worked at the Spokesman for nine years and joined the Rotary in 2002 as a representative of the paper. A message conveyed in his first Rotary meeting stuck with him. "They said be aware that in this club, Rotary is not a spectator sport," Kipp said. "It's a thing where you can get involved. It definitely has kept that promise since then." All these years later, Ludlow believes Kipp is one of the most hardworking and impactful members of the Rotary. "Curt is the embodiment of hard work and attention to detail," Ludlow said. "If there's a slot to be filled he's the first one to step up." A few years after the Rotary's Summer Concert Series, which is held annually in Town Center Park, was inaugurated, Kipp became the chair and decided to implement subtle yet important changes. Early on, he was shocked to learn that many concert attendees thought the City of Wilsonville put on the event instead of the Rotary. "It's easy to assume that the community knows what happened or why it happened, Kipp said. "We found out that wasn't the case." To ameliorate the problem, he helped make bigger banners, create a concert program and post more signs around the event. "It's not my approach to invent new things. My focus is on making them better and listening to the problems they have or the observations they have and then trying to find solutions," Kipp said. "Publicity was an issue. The awareness that it was the Rotary putting them on was a really big issue." Kipp also helps organize volunteers for the concerts and book the bands. 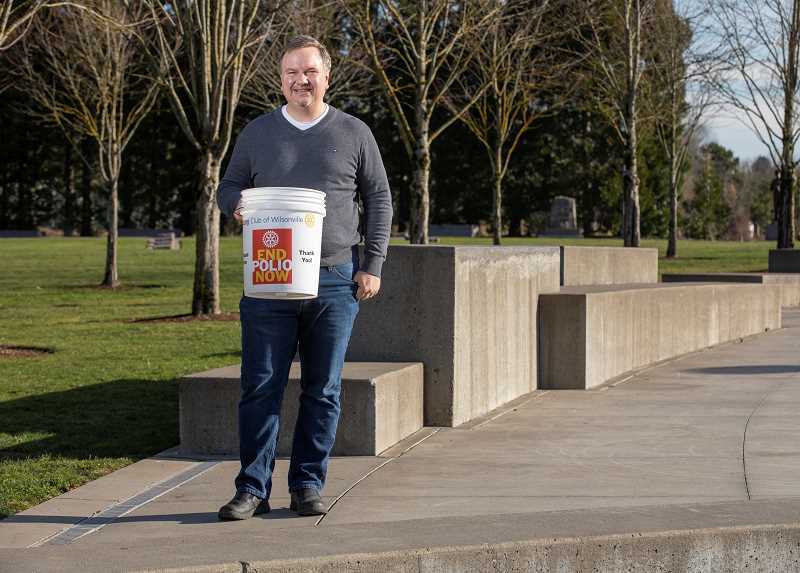 Through the series, the Rotary has raised $72,000 in the last 12 years to fight polio. Beyond its help to eradicate a pernicious disease, Kipp views the concert series as a reason for the community to reconnect and form tighter bonds. "It's really about people getting together, having fun and enjoying high quality music and in a fun environment," Kipp said. "You have people sitting in chairs on the lawn and your kids playing in the fountain. It's a great opportunity to encounter the people who you wish you were around more who are a part of the community." One of Kipp's other responsibilities is organizing the Rotary Omelette and Pancake Breakfasts, fundraisers that benefit local organizations such as parent teacher associations. Through that program, he helps organizations raise money, find sponsorships and advertize. "They have to do that on their own but we give them the blueprint to run from. We can't create a turnout for such an event," Kipp said. "Think of us like a caterer but we do have experience in fundraising so we can consult with you to achieve your desired outcomes." Ludlow said Kipp's communications skills have been particularly valuable to the Rotary. "He's blessed with creativity, writing," Ludlow said. "He really is blessed with some talents that have been beneficial to the Rotary." Kipp continued on with the Rotary after leaving the Spokesman for his current communications gig with the Oregon Association of Nurseries, served as the Rotary's president for one year, is currently the service chair and participates in Rotary events such as the Through A Child's Eyes program, where Coffee Creek Correctional Facility inmates spend a day with their children with various activities available. "It's such a great experience to support parents, moms, that are trying to rebuild that relationship with their children," Kipp said. "And that's often their greatest motivator to make their time that they're serving productive is to think about their kids and rebuild that relationship." Kipp is a Donald resident but feels much more connected to the Wilsonville community and has made many friends through the Rotary. Though he says the Rotary has grown modestly since he first joined the program, as a communications and community building guru, Kipp will continue to work to make that number rise in the future. And he believes he is an example of how citizens can make an impact. "If I'm an example of anything it's just that it has lots of opportunities," he said. "We're always looking for people to take things on and push the sled."